Tailored courses to suit you, your bike and your ability. Ideal for people who have already completed their Qride training or who have been riding for some time. Have you had a near miss recently or maybe you are more comfortable turning left hand corners than right hand corners, have you almost overbalanced while stopping your motorbike in a car park, service station or anywhere for that matter? If you have answered yes to any of the above you really should consider finding out why these things have happened. We can use video cameras attached to the bikes during our lessons and courses to assist, and show you exactly what you are doing and this can often assist in the correction process. Motorcycling is a whole of life learning experience. Do you find it nerve wracking? It can be- or it can be a well planned and well executed safe manoeuvre. We'll help you learn the finer points of safe overtaking because there is more to it than just turning the throttle or your motorcycle. 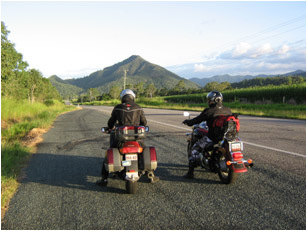 If any of the above things have happened to you while you have been riding or even as a pillion rider we know we can help you identify where you need to improve and help you put in place a riding system so that you will improve and overcome many issues you may have with your motorcycle riding technique. Often we find that small, subtle corrections make the world of difference to our riding experience. But we cant fix it if we don’t know what to fix. Call today, you might be surprised at just how easy the correction process can be. Braking- Its important to know how to stop. Did you take up motorcycling to experience braking? Probably not. However, did you know your brakes are more powerful than your engine? Are you tentative with the front brake because you fear losing control or locking up? Have you dropped the bike or nearly dropped the bike stopping at an intersection or parking area? You'll learn how to make the best use of an often misunderstood and often poorly used control..
How well do you use your gears? Do you find yourself stalling up at traffic lights or intersection? Or maybe changing down in the middle or at the exit of bends? Using the correct gear at the right time in conjunction with accurate use of the throttle and brakes is one of the keys to smooth riding. We'll show you how. Do you know exactly where you need to be on the road and why? Positioning correctly is the key to being comfortable while riding your motorcycle in traffic safely. About 30% of motorcycle crashes see the motorcycle running into the rear of the vehicle in front. Did you know that 18% of motorcycle fatalities occur at intersections almost double the risk of other vehicle drivers? Accurate positioning is a visible hallmark of an advanced rider. You'll learn to automatically position yourself correctly for the best view, the best tyre grip and all in the name of safety , your safety. Do you find taking bends to be a bit scary or run wide over the double lines or get very close to the edge of the road when you exit a corner ? Cornering is a thorn in the side of many riders when it should be the most enjoyable part. Your bike must lean over to negotiate a bend, it really is the essential skill of motorcycling. Unfortunatly, while we know how important leaning our motorbike into a bend is there is often a fine line between getting it right and getting it wrong because there is more to turning a bike than just leaning. Learn how to accurately determine the correct speed for every bend. Master your steering control and discover why a motorcycle is much more stable than you might think.